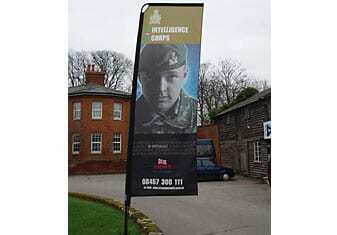 Feather banners offer a more traditional flag shape whilst still being lightweight and portable. They are engineered to allow double sided printing as an option to increase brand visibility. Like the Wing banners, the feather banners share the same innovative rotating mechanism which allows them to ‘feather’ out of the wind. Their durable construction means that they with work for years. They come supplied with a ground stake as standard but are also compatible with the additional hardware such as weighted bases. It is possible to just replace the flag to update your message and re-use the feather banner hardware for the next campaign. 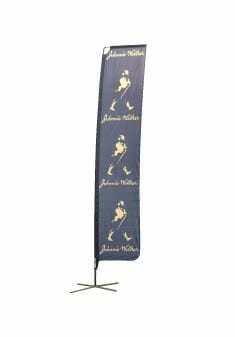 They are lightweight & portable too with the extra large wing banner weighing in at just 3.2kg for a display of 4.5m in height. 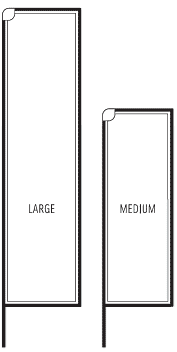 Single sided and double sided versions are available in each size. 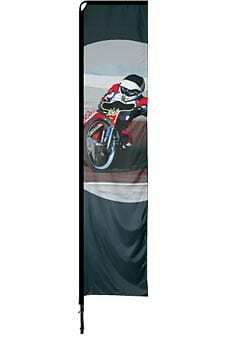 Both medium and large Feather banners are available in 3 widths, 600mm, 800mm and 1000mm.